Summer time in my house means no ovens, simple healthy meals, and lots of flavor! This dish fills all of those requisites and has been a staple in my kitchen since college. The reason it sticks with me is how nourishing, adaptable, and inexpensive it is to prepare. I may have gotten the biggest surprise with this recipe when I recently made a batch and shared some with my dad to try for his lunch. First, you have to know my dad is a self-proclaimed “South Georgia Boy” in his early 70s who likes fairly traditional foods; for him, pasta should have marinara and tacos should have salsa. He was more than skeptical when I told him what was in this one, but to his great surprise and mine, he really enjoyed this as a cold pasta salad and even asked me to make it again. The ingredients and amounts in this healthy pasta recipe are more like guidelines than requirements. I learned long ago I’m not a fan of fussy recipes with strict ingredients, and learning to adapt a recipe for taste preferences or just to make practical use of what’s in your pantry is the best meal-planning skill to have! 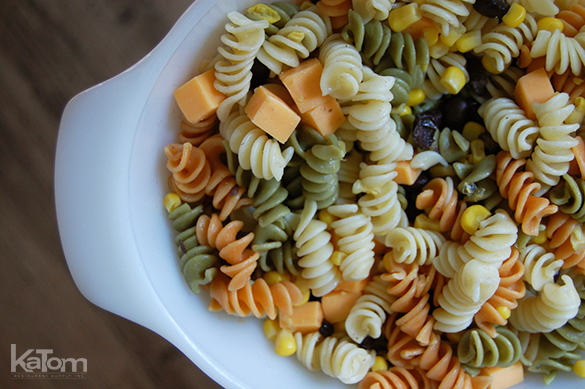 Another perk to this healthy pasta recipe is how well it packs for lunches and holds up for several days in the fridge. 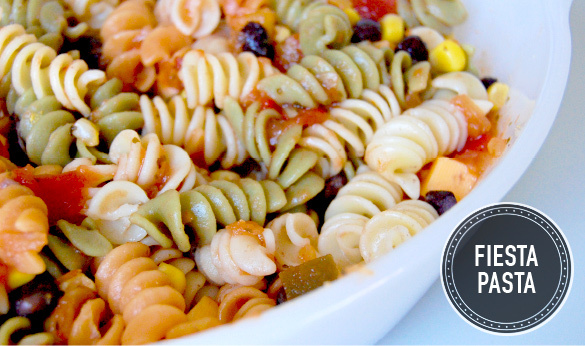 Once you’ve created your fiesta pasta, portion your batch into multiple small containers to keep in a lunchbox or stash in the fridge at work. If you’re looking for extra nutrients packed into your meals, add diced onion, yellow and orange bell peppers, zucchini, chopped avocado, or any other fresh veggies you have on hand. 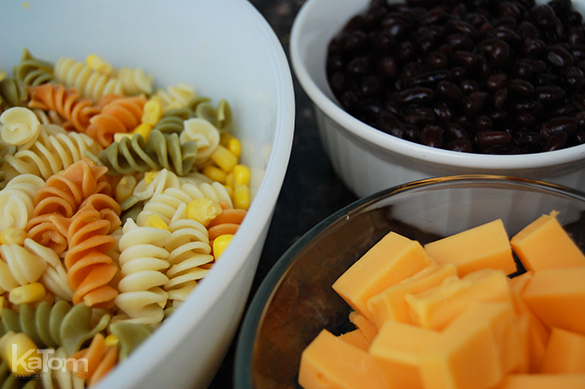 Take care of chopping while the pasta cooks and this dish still gets wrapped up in less than 20 minutes. This entire recipe is easily under $10, even with the cheese, which means your budget may thank you as much as your taste buds.